Happy belated holidays. As you can guess life has been busy. I had a lovely holiday season with my family and friends and I got extra special Christmas gift this year – a job! Yep a job. It’s a contract position for now, but could become something permanent. So far I really like the company so we’ll see what happens. The cool thing is I have officially registered as a company so I could be proper vendor for this job. This means if it doesn’t lead to permanent work I’m all set up to continue on as a freelancer. Okay enough about boring life and onto knitting. I have been knitting like crazy over the holidays, sadly it’s been mostly on the same gift :(. 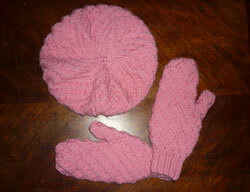 I had a lot of trouble with the Cable Swirl Tam and Mittens from Creative Knits. I don’t know if I just didn’t understand the pattern for the tam or if it’s actually in error. It took three attempts and several unmentionable words to get a good tam out of the pattern. I ended up changing the pattern to make it work. The mittens were not an issue which makes me think the problem was the user (me) and not the pattern. Anyway here is the lovely set all done (please note I’m not modeling it since I don’t look good in tams or this shade of pink). I’m continuing my work on the Welt sweater I started before the holidays and I can’t wait to wear it. The next project is going to be a Dr. Who scarf for my husband who has been complaining the I never knit him anything – which is sadly, almost true (maybe I fear the boyfriend sweater curse).